The giant Apple announced 2018 new iPad Pro with 9.7 inches, A10 chip with 64-bit desktop class architecture. Up to 12 million pixels, iPad Pro gets a spot in the best 2017 tablets to play HD, especially Ultra-HD videos. But when users want to watch 4K video on iPad Pro's 12.9-inch/10.5-inch Retina display... things are not satisfying all the time. iPad Pro can not play 4K UHD videos of any formats, say, MKV, FLV, MTS, AVCHD, WMV, etc, not to mention the large file size of ultra-high definition videos that can easily eats iPad Pro's storage. iPad Pro 4K video converter is badly needed to help convert UHD video to iPad Pro. MacX Video Converter Pro is especially designed for 2017 iPad Pro, with which you can use iPad Pro to watch 2160P videos with no video formats limits. It makes it easy to play 4K videos on iPad Pro, iPad Air 2/mini 4 etc by converting 4K video to iPad Pro with video audio format, parameter settings all matched in 5× faster speed and zero quality loss. It helps iPad Pro to open 4K UHD video in MP4 MOV M4V format by converting from WMV, MKV, TS, MTS, AVCHD, FLV, 3GP, DV, etc. Besides, it also allows you to compress large HD/UHD video to iPad Pro to 90% smaller size. This iPad Pro video converter also helps users to enjoy Ultra HD video with iPad Pro from online sites. It will free download 4K UHD 2160P, HD 1080P/720P videos from 300+ sites and convert to iPad Pro, so that users can play YouTube 4K videos on iPad Pro etc as they like. Worth noting that though you import 4K UHD video to iPad Pro in iPad Pro supported formats like MP4, AVI, you will find the iPad Pro can't play the 4K videos. This is because of different video codec, convert it, that's all. Step 1: Free download the 4K UHD video converter for iPad Pro (Mac version, El Capitan supported) and run it. PC users just get the Windows vresion. Click "Add Files" button to load the video file. Step 2: Choose an output profile. MP4 video format is OK, or you can head to Output Profile > Apple Device, and select iPad Pro. Step 3: Click the "Browse" button to select a destination folder to save the converted 4K UHD video. Step 4: Click "Run" button and start the 4K to iPad Pro conversion process. If you wanna compress 4K video file for iPad Pro in smaller size, adjust the video resolution, bit rate, frame rate, etc. Wanna view 4k online videos on iPad Pro? In fact, 4K has made its way to video sharing site, Like YouTube, Vimeo, Dailymotion, good places to turn for 4K UHD video playback using iPad Pro. MacX Video Converter Pro, the 4K UHD video converter for iPad Pro recommended above can enrich your iPad Pro video resources in 4096 x 2160, thanks to its ability to download 4K Ultra HD videos movies from YouTube, Vimeo, Facebook, Dailymotion, Metacafe, and other 300＋ sites in a few seconds with original quality kept. To download 4K UHD video to iPad Pro, you only need to copy and paste the video RUL. But make sure the video format is accepted before you import and play 4K UHD YouTube video on iPad Pro. This is a step-by-step guide on how to easily download and convert YouTube videos to iPad Air on Mac with one of the best YouTube downloader and Converter. iOS 11 iPad Pro 2017 is coming, and this tutorial shows the detail information about how to convert video to iPad iOS 11 on macOS High Sierra with iPad video converter. How to Transfer Video from 2017 iPad Pro to Mac without A Hitch? In search of the easiest way to transfer video from iPad to Mac? Learn how to transfer videos from 2017 iOS 11 iPad Pro to Mac effortlessly here. 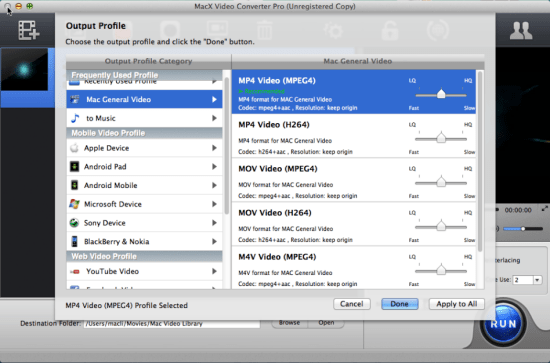 MacX Video Converter Pro provides the best video converting solution for iPhone users. It is a feature-rich, high quality, and incredibly fast video converter.